These young larvae of giant swallowtail butterflies have pushed me even further from being comfortable using Bt (Bacillus thuringiensis), the biological pesticide, to control pest worms. This question of controling caterpillars has come up more than usual this year because of the huge out break of fall webworms. Bt only kills Lepidoptera insects, but that means both moths and butterflies. The butterflies have already been great this year, and I think we have much more show to come if we do not kill them. Caterpillars are worms or larvae of moths and butterflies, and they eat plant foliage. They can be controlled with Bt sprays, but also orange oil based sprays or neem sprays. Native wasps will also help control them. The best wasps to release are the tiny trichogramma wasps. I didn’t spray for webworms at my house or office, opting for the most organic control of all – tearing the webs and letting the birds and wasps take care of them. Worked great! If you do need to spray in the future, the orange oil products are probably better because they have to actually hit the insect to kill. Bt kills as the insect eats the sprayed foliage, so there’s more risk of killing beneficial bystanders. For sure, only spray the plants under attack and don’t forget to release trichogramma wasps next spring before the pests show up. Why do the little parasitoid wasps not kill the butterflies? That’s one of Nature’s wonderful mysteries. It might be partly due to extra thickness of the butterfly eggs making it impossible for the trichogramma wasp female to deposit her eggs. Or it may just be that there’s no attraction to the butterfly eggs. 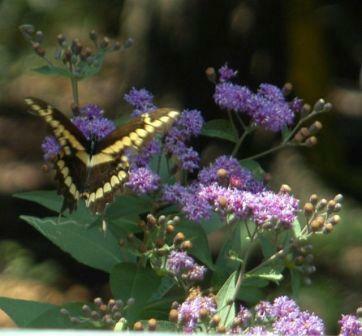 Here’s our latest information on swallowtail butterflies from the Library on DirtDoctor.com. A strong flier with distinctive yellow and black striped markings on its wings and body (some females are brown or black, mimicking the poisonous pipevine swallowtail). This relatively common butterfly has a wingspan of 3.5 - 6.5 inches. These butterflies are called swallowtails because they have long "tails" on their hindwings which look a bit like the long, pointed tails of swallows. Egg: A butterfly starts its life as an egg. The female tiger swallowtail butterfly lays its spherical, yellow-green eggs on a leaf high in a tulip tree, sweet bay, wild black cherry, ash, lilac, aspen, birch, choke cherry or other plants. Caterpillar: The larvae (caterpillar) hatches from an egg and eats the egg shell. Then it eats leaves almost constantly. 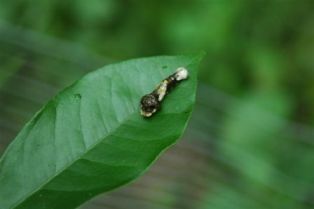 The newly-hatched larva is brown and white, and looks like bird droppings, but it turns green later. The caterpillar loses its old skin many times as it grows. 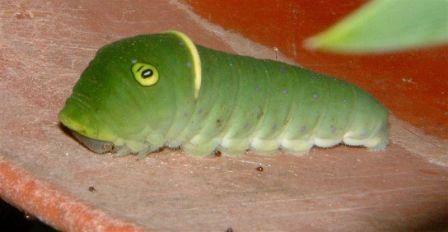 The mature caterpillar is plump, smooth and green with large yellow eyespots that have black "pupils." There is a yellow and black stripe where its "neck" should be. It grows to about 2 inches. Adult: A beautiful butterfly emerges. There is no growth during this stage, but the butterfly will sip nectar. This adult will continue the cycle by producing eggs; females produce two broods in the north and three broods in the south. Wings have distinctive yellow and black stripes. Some females, especially in the south, are much darker, mimicking the poisonous pipevine butterfly. The giant swallowtail butterflies are also known as the "orange dogs" because they eat leaves from the orange trees and other citrus as you can see in the first photos. Egg: Females lay yellow-green eggs singly on host plants. Caterpillars hatch and develop through several stages before forming a chrysalis or pupa, which is attached to the host plant by the back end and held in an upright position by a silk thread around the middle. 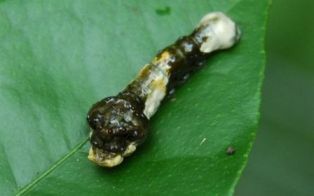 Caterpillars (larvae): Dark brown with creamy white mottled markings, making them appear much like bird droppings. When disturbed, caterpillars display a pair of horn-like, orange glands (osmeteria) which emit a foul smell. Caterpillars feed on leaves of host plants including citrus, gas plant, prickly ash and rue. 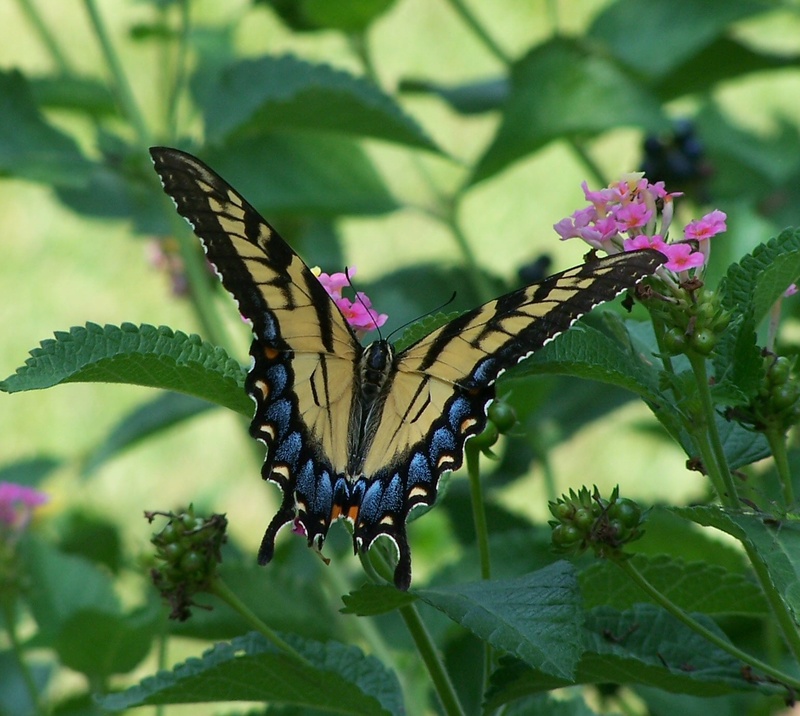 Adult: This butterfly is one of the largest swallowtail species, with a wingspan of up to 6 inches. Wings are black with yellow markings near wing margins and spots forming a diagonal band across the wings.